Thanks for your interest in my ﬂutes. Ritual ﬂutes. Why “ritual”? They are tuned and of good sound quality, so, yes, of course they can be used purely as a musical instrument. So why are they used for breathing our prayers, crying our grief, laughing our joy into? Well, ﬁrstly they are tuned to the pentatonic scale, making them easy to play intuitively and spontaneously without notes. Using your ﬂute in this way makes it a sacred object and a partner in your spiritual practice. So, just having your ﬂute present is a support in itself and of course more so when it’s being played. Also, the methods of creating, or birthing, a Flute can be seen as a deep metaphor. I use natural bamboo grown in Florida by a Flute maker especially for the purpose of making musical instruments. As I unpack a shipment of bamboo, it’s plain to see that each piece is organically unique in its own way. Some of them are partially dry, some still green, some crooked with bumps and scars, some are pristine without a mark on them. The ﬁrst step in using these raw pieces of plant to make a Flute is to clean them up and remove the inner walls except one. Then the bamboo is cured by heating it. Curing bamboo is not only for the purpose of drying them, but also to harden and eventually darken the wood. There are diﬀerent ways of curing bamboo, of which boiling or baking is one. I have chosen to use ﬁre as not only a heating method but also a symbol of puriﬁcation. So you will notice that some ﬂutes that have dried slowly and steadily on their own will be a light blonde color, innocent and clean, while some are dark and blemished, having experienced transformative processes. Like us humans, each piece of bamboo has its special quirks and characteristics. I assume, since they have come to me, they are wanting to be of service to us, and so are treated with the utmost respect and care. I rarely give up on a piece. Some of them become a ﬁne instrument almost immediately. Others sit on my table for months going through various adaptations, patching, cutting before they are good enough. Some pieces of bamboo, despite having been prepared and cut mathematically correct, holes all in the right places in the right sizes, the ﬂutes length and sound holes technically perfect, still refuse to play smoothly. Like people, they need to grow into their potential, and for some it’s an easy ride, while others go through all kinds of experiences before ﬁnally arriving. There is no right or wrong in any individual process, no better or worse, just whether it’s working or not. You may notice that the mouthpiece end has purposely been left open and you do not need to purse your lips to play. This has been done, not only as symbol of a wide open connection between your breath and the heart of the ﬂute, but also to give you space to use the form of your lips freely in making sounds. The feeling of holding and blowing into a branch or cut of bamboo without unnecessary human interference in form, heightened the sense of being one with nature and the earth. One of the reasons I started making these beautiful instruments is because I have relatively small hands and found them cramping as my ﬁngers stretched to reach the widely spaced holes of most mass produced ﬂutes. The tone holes have been placed closer together than the standard, and the holes are individually tuned by adjusting their size. 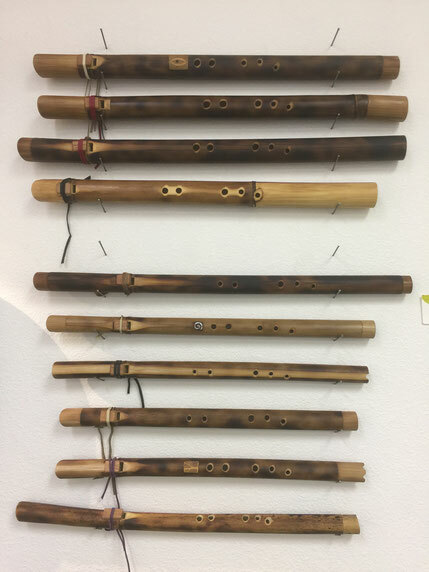 After the ﬂute is complete, it rests awhile on the studio walls with its companions before being tested one last time. Some ﬂutes change during this respite and are again on my table for touch ups. Each ﬂute has a guide, a muse, angel and/or tutilary spirit, here for you, at your service, having ripened and matured through all the processes of its birth to earn the title of a sacred object. As the two of you work and play together, you will each adjust yourself to the other to make the most expressive sounds and tones of your heart, reaching into dark corners to bring light, soaring high to sing with joy and being there together in all the inbetween places to celebrate life in all its forms. Each of you appreciating the others scars and patches, smooth spots and roughs areas, living the bounty and the vibrations of life. Enjoy! I’d love to hear how you’re doing. Also, if you have an inquiry or wish to leave feedback, feel free to contact me. Thanks so much for supporting my work with your purchase. How to care for your ﬂute. Excepting a few drops of glue and an edible mineral oil ﬁnish, your ﬂute has been left natural. Any non-rancid oil or wax can be used if you’d like to nurture its ﬁnish. If you’ve played the ﬂute for a length of time, condensed water collects under the ﬂute block at the sound hole. Undo the leather strap and let this dry out occasionally. Each ﬂue block is tailored speciﬁcally for that ﬂute, so take care not to misplace it. Like any other wooden object, if it gets too dry or is mishandled, it can crack or break. If the injury is small, a bit of glue might do the trick. You may also contact me for advice, a wrapping or repair. How to play the ﬂute. 1. Check that the ﬂue block is placed to the back marker and straight, so that the air ﬂows evenly onto the sound hole edge. If the air ﬂow is uneven, it will cause squealing. 2. Right hand on the lower side, left on top, close the holes ﬁrmly and completely with the pads of your ﬁngers. Any space left open will cause squealing. 3. Keep enough ﬁngers on the ﬂute to enable playing with all holes open. 4. Open the holes from the bottom up and close from the top down. Be sure the holes beneath the tone hole you’re playing are open. Now play any combination of this scale by varying your breath, your lips and tongue to make the sounds that express what you’re feeling. You will become familiar with each tone hole, and hone your skills over time. There are tons of lessons and videos on the internet that will keep your abilities growing for a long time.